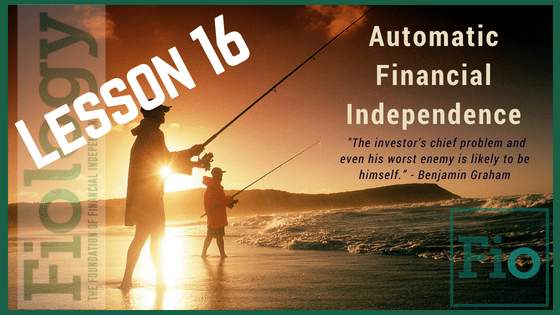 Once we automate our finances, and our investing specifically, we can focus on other important aspects of our lives with the assurance that we are well on our way to Financial Independence. Our stress levels may decrease while our account balances increase with regular contributions coupled with the power of compound interest. This lesson not only describes why automation is important, but gives specific guidance on how we can incorporate automation into our FI plan and other aspects of our lives. Read: Automation and Organization: A Recipe for Success by Cody of flytofi.com. This blog post describes how we can use automating in many aspects of our life, including finances. Take Action: Based on the resources provided in this lesson, determine what steps you can take today to set up automated payments and/or transfers to reduce the number of routine financial decisions/actions you make. Then, over time, become more assertive and invest a higher percentage of your income. Awesome content and thanks for including my post! Absolutely! I’m looking forward to seeing you at CampFI South in September 2018.